The night started with a cheese and charcuterie plate paired with the choice of either Left Hand’s Stranger Pale Ale or Firestone Walker’s Solace Summertime Fusions Wheat. Not being much of a wheat drinker I went with the Stranger, which I love. We were let in on a little secret about the genesis of this beer’s name. I was surprised that I hadn’t put two and two together before, (being the one in the room with the dirtiest of minds on most occasions). Think about it . . . left hand . . . stranger . . . if you don’t get it yet, ask your brother. The 2nd course was a refreshing chilled golden beet soup with smoked goat cheese, candied almonds, truffle honey and chive oil paired with none other than the king of imperial IPA’s: the Double Jack from Firestone Walker. I’ve praised the Double Jack before for it’s intense yet balanced hops and beautiful grapefruit citrus notes. 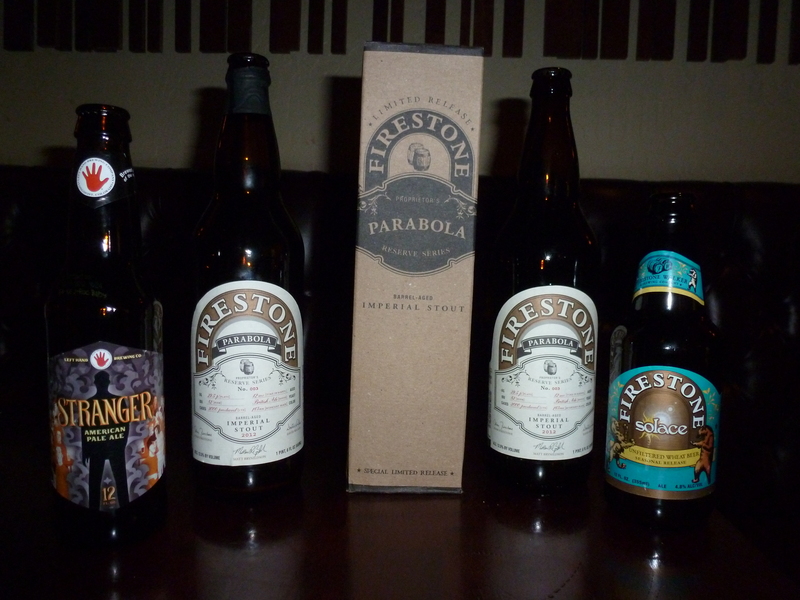 I love that Elizabeth Kagan, Colorado Sales Manager for Firestone Walker, started the night off with the 9.5% ABV and 100 IBU Double Jack. Brewed with four pounds of Amarillo, Simcoe, and Chinook hops per barrel, it’s no wonder that this beer got the conversation started and the decible level rising in the room. For the salad course we enjoyed the Left Hand seasonal, and one of my new favorites, the Good Juju Spice Ale paired with a delicious cilantro lime shrimp salad with mandarin orange, avocado, and curried bacon. I loved the combination of the strong ginger notes in the beer with the curried bacon flavor. This was such a smart pairing with beautiful complimentary and contrasting flavors of sweet, savory and spice. The Good Juju is brewed with organic Hawaiian ginger, which changes the flavor and spice tones of the beer from year to year. To me, the spice was spot on, you get the sweetness and the spiciness of the ginger at different points throughout the beer. If you are looking to try it out, Highland Tap and Burger is one of three places in the state of Colorado that you can get Good Juju on tap all summer. During this course we had some time with Eric Wallace, Left Hand co-founder, who shared some insight into his background and the background of Left Hand Brewing. He and another Air Force buddy, along with his wife, started the brewery in 1993, brewing their first beer in January of 1994. Eric also shared his philosophy on how beer is more sophisticated than wine: “smash grapes and it turns to wine,” adding, “farmers make wine and engineers make beer.” These are not necessarily the opinions of Lady Lupulin, but Eric isn’t too far off. 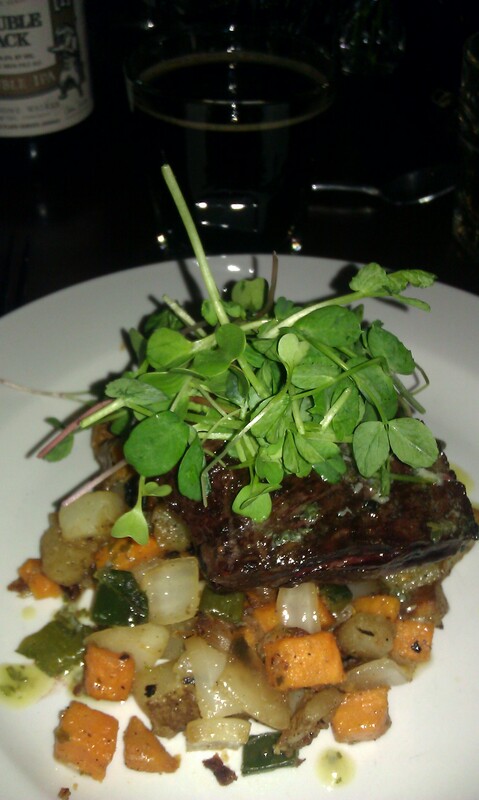 Now for the main event, the grilled skirt steak with vidalia onion poblano hash, pea shoots, and chimichuri butter paired with a beast of a beer, the Parabola Barrel Aged Russian Imperial Stout from Firestone Walker. This beer is a monster, strong and in your face. It’s no wonder that as soon as it’s released, it sells out within 24 hours. Keep a look out for it next spring, and don’t hesitate when you see it at Argonaut, Mondo Vino, and other enlightened liquor stores. 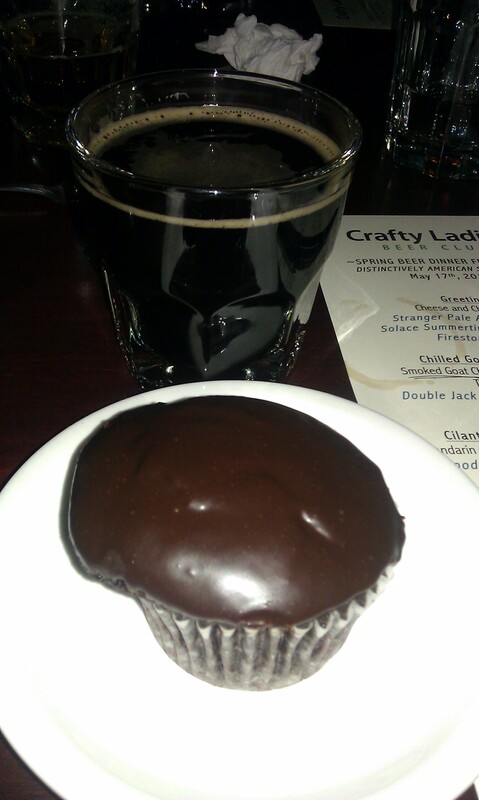 Rounding out the evening was the sublimely American very chocolate cupcake with chocolate ganache frosting paired with the Beer Week inspired Beer Week Sauce Coffee Infused Porter from Left Hand. The Beer Week Sauce is brewed with Allegro Coffee, using Ethiopian beans. Coffee and chocolate are always a huge hit, and this beer certainly brought out the sweetness and bitterness of the chocolate, at least what I could taste of it after the heavy brews that preceded. As always, thank you to Katie and Juan at Highland Tap and Burger, Elizabeth from Firestone Walker, and the entire Left Hand crew that made the Spring Beer Dinner a success. This entry was posted in Craft Beer Adventures, Food and Beer Pairing, Women and Beer and tagged Colorado Beer Week, Crafty Ladies, double jack, Firestone Walker, good juju, Highland Tap and Burger, Left Hand Brewing, parabola, solace summertime fusion wheat, stranger pale ale.